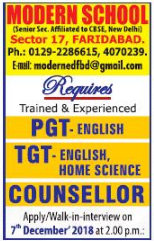 Modern School, Faridabad has advertised for recruitment of Teachers PGT / TGT jobs vacancies. Interested and eligible job aspirants are requested to apply or walk-in on 07th December 2018. Check out further more details below. About School: The Modern School came into existence on 20th October 1920, with six children on the rolls (the numbers swelled up to twelve by the end of the year) at 24 Daryaganj, a nineteenth century family bungalow, with Ms Kamala Bose as its first Principal. Then a day boarding school, with 125 scholars on the rolls, it moved to a new and its present location at Barakhamba Road on 4th January 1933. Trained and experienced persons are required. How to Apply: Interested and eligible candidates are requested to attend the Walk-in interview along with CV, originals & copies of certificates, testimonials and recent Passport Size photograph to the walk-in address mentioned below.